Does the Wall Street Prep Certification Matter? - Wall Street Prep	Does the Wall Street Prep Certification Matter? Does Wall Street Prep's Certification Matter? 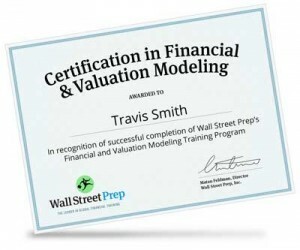 Trainees that complete Wall Street Prep's Premium Package or live seminars, are eligible for Wall Street Prep's Certification in Financial & Valuation Modeling. Certification is issued only upon passing an online examination (70% is the passing score) which tests the concepts taught in the Premium Package and live seminars. Wall Street Prep’s Premium Package includes foundational financial modeling courses and the Wall Street Prep Certification Exam. However, when those other elements are in place, the certification can help “round out” the profile. The reason is that since Wall Street Prep works directly with corporate clients, the certification is a “seal of approval” of sorts that hinge on the reputations of the training providers. At Wall Street Prep we consistently receive calls from employers to validate certification claims on candidates’ resumes – employers would only do this if the certification mattered. For international students and students that come from a liberal arts background, certification is a highly effective way to demonstrate basic competence in financial concepts and modeling. It should be noted that some have argued that such a credential may potentially be counter-productive because it will expose the trainee to more challenging technical questions. This is a red herring; it is true that the more candidates represent that they know during interviews, the more they will be challenged. But this is not unique to candidates who complete a program like this: A finance major will undoubtedly receive more challenging technical questions than a music major. But stronger resumes are also more likely to lead to an interview in the first place. From our experience, if the candidate is careful about not “overselling” the experience, the advantages of using such a Certification as a credential far outweigh any perceived risk. I highly recommend WSP. I did their self study program and learned an incredible amount of information you would never see at the university level in such detail. It’s not a waste of time if you truly learn and figure out how to market the information. Basically, you have to make your intangible skills tangible. So prepare yourself for interviews by providing recruiters and hiring managers with examples of models you have built. Maybe even model the company you’re interviewing for. Read their 10k’s before hand so you can truly speak intelligently about their operations. What is the average number of hours in total needed to complete the Premium Package? The premium package consists of 6 modules with around a total course material time of 45 hours, so I would assume a total time required of about 50-60 hours including the exercises and quizzes. Does the Premium Package access expire? How long do I have before I must complete the exam? If you purchase the Premium Package you will have lifetime access. Access to the Certification Exam will not expire. You can take the exam at any time. Would you recommend taking the online premium package course first and then also taking the boot camp in-person course for F & V modeling or is that essentially the same curriculum and redundant? Passing the WSP certification exam will help you obtain the certificate. Going to the class will help you get an in-class experience of the content that you will be tested on in the Certification exam. It depends on how well you learn in a classroom, or on your own - hope this helps! How many retakes can we take in total? You have 2 attempts per exam - thanks. That means 1exam and 2 additional attempts? It means 1 exam and 1 additional attempt - thanks! I am intersted in Bank & FIG Model but I have some doubts. What is the material provide it¿ how long is the guide provide it¿ how long it takes the course.
? Is there an exam or certification at the end of the Course? 1) You will get access to our self study materials. Currently we do not have videos produced for this course. 3) Please email support@wallstreetprep.com to discuss any certification related to this course. Which courses are the most important to pass the Excel exam? Will the test cover all of the courses, or only a select few? For the Excel exam specifically, I would make sure I go through the Excel Crash Course thoroughly. Hope this helps. Another question. Do you train on Interview Questions and Answers. If so , which program is that? I could not find it in any of the packages. Thanks. We do have a private tutoring program - if you are interested please email support@wallstreetprep.com to find out about our private services - thanks! I have graduated from Masters in Economics in Canada and I went back to my country and it has been almost years since. But I want to find a job in Toronto. You can say I am not a recent grad. Do you think Wall Street Prep only caters to fresh graduates, MBA and students ? Would it be helpful in finding jobs in boutique IB banks, brokerage research companies, etc? WSP is a great continuing education / re-tooling resource - the topics discussed here will definitely help in recruiting for boutique IB banks or sell-side research companies - thanks! Hi, Where can I have the re-take of the examination? After you take the exam and don't pass, there is an automatic link available for a re-take. Let me know if you are having trouble with this - thanks. I do not see the link available for a re-take. Is there any other alternative that I can re-take? Please reach out to support@wallstreetprep.com regarding this matter - thanks. Would the Premium Package benefit someone desiring to go into corporate finance, or is it mostly geared toward investment banking? The premium package would definitely help someone going into any field within corporate finance; either at a company or at an investment bank. Would you say obtaining this certification helps when I'm applying to a top tier MBA program? Especially for someone who is not a finance major. It definitely demonstrates your desire to become more proficient in finance, so yes, it would help. If you've finished an exam and do not pass, you will get a prompt for a re-take. We allow 1 re-take per user. Hope this helps! How many hours the exam and do I needs to pay the course and exam? We recommend you go through all courses in our Premium Package before you take the certification exam - thanks. I was curious as to what happens if you do not pass the exam? Whether it be on your first attempt or additional attempts. You have a maximum of two attempts to pass the exam - hope this helps! Hi. I would like to know the format of the exam. How many attempts we get and is the exam taken online? Thank you. The certification exam consists of multiple choice and fill in answers. You get two attempts to pass the exam, and yes, the exam is administered online. I've purchased the 3-day Financial and Valuation Modeling Boot Camp package - will this give me access to the exams? Thank you. Lin - please reach out to support@wallstreetprep.com for this question - thanks! Can we only appear for the examination without enrolling for the premium package? You cannot get access to the exams without purchasing the premium package, so it's in your best interest to review the materials in the premium package before taking an exam. Hope this helps! As this is a very specific request, please reach out to support@wallstreetprep.com - thanks! Once i fall the exam, would the second exam be same as the first? The exam will test the same content areas, but it will be different from the first. so how long is the exam , how come some says 3 hours some says 90 minutes ? WSP provides guidance that you should budget approximately 90 minutes to complete the exam. I didn't receive the excel shortcuts PDF. How do I get that with my premium package order? I would say you should review all courses that have "Premium Package" labeled on them - taking these courses will best equip you for the certification exam - thanks! Bashar - great job - apologies for the late response! 1. Is the exam timed? 2. Will I be able to view the correct answers once I complete the exam? It will be very applied - 50 MCQs - you will have more than enough time to complete the exam. How many questions will be asked in the exam? and what is the expected allocated time? is it 50 MCQ questions or 24?? and how will the exam will look like one or few cases? and will there be theoretical questions? Can you elaborate more on how the exam is going to be like? what kind of questions should I expect? Will it be based on a case? Will I be tested on concepts or will I have to build a model? The course is intended for newbies! We don't expect you to have any working knowledge of the subject matter before starting the course. How much financial knowledge is required before starting the Wall Street Prep course? We quizzes in some of our courses, but no we do not have any practice exams. The lessons themselves are hands-on practice and should be more than enough to prepare you for the certification exam. The exam also includes LBO topics. Hi. I am based in Botswana in Southern Africa and would like to know if you have practice tests that one can use to prepare for the exams upon finishing the course. Does the exam cover topics that were taught in the advanced LBO modeling as well or only up till the M&A course? Absolutely not, you have access to your package indefinitely! Will i lose access to all the videos and materials of the premium (online) package if i pass the certification test? Thank you for all the hard work you are putting into this educational platform. Wall Street Prep’s Certificate of Financial & Valuation Modeling is awarded to those who complete the Premium Package or a Wall Street Prep Financial and Valuation Modeling Boot Camp and have passed the Certification Exam by scoring 70% or above. The 3 hour examination in administered online, and users may attempt to take it no more than 3 times within 24 months from the date of enrollment. Proof of certification is available for users to download upon passing the exam. There are no additional fees. hello i would like to know how much is it cost? With our courses you can start from ground zero with no knowledge in finance or accounting. I recommend our basic Accounting, Corp Fin and Excel courses to start and then moving in the financial modeling courses. What previous college or technical knowledge in finance should I have before enrolling in your program? I'm not sure how you want to expand your career, but our courses are typically used by people across the globe that want to move into investment banking or equity research or similar careers. Please read my response above in regards to our course and certification and their uses. I've provided a link (https://www.wallstreetprep.com/self-study-programs/premium-package/) that provides course details, including the cost. The Certification Exam is included in the course package and consists of 50 multiple-choice questions that focus on major modeling topics covered throughout the self-study course. I am working with a Broking House as a dealer from past 3 years and I have done my PGDM in Marketing. I have very good knowledge about stocks, commodities and derivatives. Do you think this certification will help me to take my career globally. And what is the fee structure in INR and how long is the course. It would be kind of you if you can send all these details. Our courses do not replace formal degrees such as a MS in Finance. But, our courses do give you hands on, practical, real-world modeling skills that you can use immediately in interviews and on the job. You can think of them as a bridge between what you learn academically and what is required "on-the job". They cover such things as modeling best practices and valuation methodologies used at investment banks and are geared towards helping you interview successfully. 1) You will be able to view and print the certificate from your My Courses page as soon as you pass the exam. 2) Keep checking back at our website - we're always introducing new materials, including webinars, that will provide you with additional skills to broaden your horizons! 1-Once I pass the exam, will you send me the certificate by express courier if I am outside US? 2- Do we get access to cases so that we practice modelling and keep improving our modelling skills? 2. Please contact Scott Humphries at shumphries@wallstreetprep.com for this question - thanks! Amit - it is online - you can take the exam from anywhere in the world, provided you have an internet connection - thanks! Once you enroll in our online courses, you will have lifetime access to them, and can access them anytime. 2. Do I have to already be a CFA Charterholder to receive the 35 PD credit hours, or can these be applied prospectively once I receive the Charter? Can I write my certification exam in India? Is it online or offline? What is the validity of a premium package account once I register? I mean is there a maximum time limit for course completion once I enroll? Is there a fee for taking the certification exam or it's included in the course fee? You have up to three attempts to pass the exam. Every time you do not pass the exam, you would need to wait 1 month before being able to retake it. The passing score is 70%. Could anyone enlighten me whether we can have more than one attempt to complete/pass the Certification Exam ? just as a matter of precaution . It's a great item to add to your resume - look at the other responses below as well - thanks! Is an MBA necessary to break into the industry? Would the combination of sell side experience and being a CFA charter holder/candidate suffice? I think the latter would suffice if you want to get into investment banking as an analyst. If you want to join as an associate, it's almost guaranteed that you should get an MBA if you haven't had prior investment banking experience. This is indeed useful. I was wondering the same, since I come from a tech background (planning on moving into Finance background). Yes and yes - 90 minute exam and you can review the questions after you take the exam - thanks! HOw many questions will be asked in the exam? The Certification Exam consists of 50 multiple-choice questions and focuses on major modeling topics covered throughout the self-study course.